Utah 's football program will stage a Senior Day observance Nov. 24, when the Utes host BYU. The pregame ceremony won't last long. Next year's event, though? That one will take awhile. The Utes have only 13 seniors (including one non-scholarship player) in 2018, about half as many as in the previous two classes and tied for the fifth fewest among Power Five programs. In contrast, they’re projected to have a record number of seniors next season — nearly three dozen, counting several walk-ons on this year’s roster — if everybody comes back, rather than entering the NFL draft. Being limited to 85 scholarship players in the program, coach Kyle Whittingham had fewer openings than allowable 25 signees in the 2014 and '15 recruiting classes, the main sources of this year's senior class. Attrition also explains how the Utes arrived with so few seniors. The 2014 group of 16 signees included 12 freshmen, and some of them ended up transferring, including quarterback Donovan Isom and receiver Raelon Singleton. Others played four straight years and graduated. The '15 recruiting class of 20 players featured several freshmen who redshirted, making them seniors next year, and junior college transfers who already moved on. Most members of the larger 2016 recruiting class played as freshmen and are on track to become seniors next season. Jordan Agasiva, OL Aaron Amaama, DL Corrion Ballard, DB Cody Barton*, LB Jackson Barton*, OL Marquise Blair, DB Lo Falemaka*, OL Jameson Field*, WR Matt Gay, K Chase Hansen*, LB Alani Havili-Katoa*, OL Derrick Vickers, WR Mitch Wishnowsky, P * – Scholarship athlete, fourth active season in program. Breaking down the 2018 senior class, the numbers are even more stark, with several nontraditional cases. Only seven seniors are projected starters on offense or defense. Only six will have played four seasons for Utah. And the group would be even smaller if not for offensive lineman Lo Falemaka and kicker Matt Gay receiving NCAA waivers for an extra year of eligibility. Five players are junior college transfers, including receiver Derrick Vickers, who arrived on campus this week with one season to play (Utah will petition the NCAA for another year’s eligibility, Whittingham said). He’s an extreme case; linebacker Chase Hansen, whose first year in the program was 2012, is at the other end. Juggling the roster of 85 scholarship athletes in the program is tricky for Utah, partly because of LDS missionaries coming and going. Another variable is whether players redshirt, sitting out a season for the sake of development during their five-year eligibility calendar. That's how the Barton brothers will end up sharing Senior Day in November. Jackson Barton redshirted in 2014 after arriving on campus a year ahead of Cody, a linebacker. Hansen, Falemaka and punter Mitch Wishnowsky are among the Utes' top candidates to be voted captains this season, as part of a senior class that has bonded. “A lot of guys have gotten really close throughout the time we've been here,” Hansen said. The contrast in size of the ’18 and ’19 senior classes suggests that Utah is building toward next season, when quarterback Tyler Huntley will be among the key players returning and the school’s Pac-12 schedule is less daunting. Utah replaces Oregon with Oregon State and Stanford with California in the rotation. 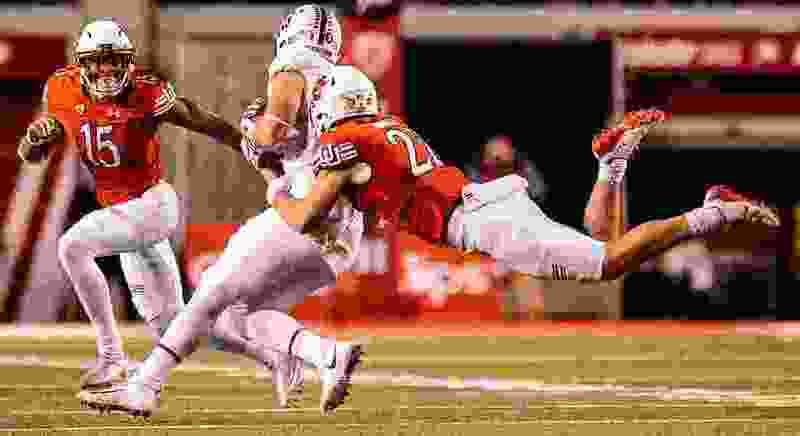 Yet the Utes will lose several impact players and strong leadership among their seniors, and juniors such as cornerback Julian Blackmon, running back Zack Moss and defensive linemen Bradlee Anae and Leki Fotu may consider departing early for the NFL.